We are a conservation volunteer group in Oliver’s Battery, Winchester, Hampshire. Our aim is to ‘Conserve, sustain and enhance the natural landscape and wildlife of Oliver’s Battery Parish’. To this end we carry out practical conservation work and also organise ‘fun’ events to involve local people. 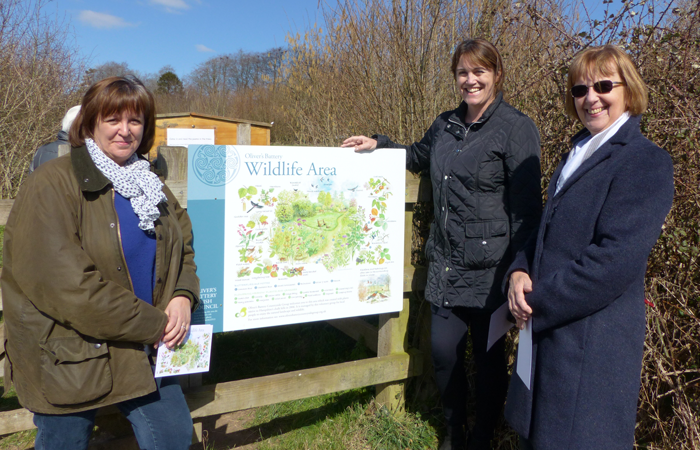 Below is a photograph taken at the unveiling of a new interpretive panel in the conservation area. Here a link for more information. At the unveiling of the panel are former parish Councillors Jane Gagel, Sarah Kahner, and Maggie Collin (photograph courtesy of Brian Collin). The 3rd Winchester City Brownie Pack, which meets at St Mark’s Church, first met in June 1971 and has been running ever since. The pack can take a maximum of 24 Brownies aged between 7 and 10 years old. We are usually full but spaces do arise as existing Brownies get older and leave. Any parents who wish their daughters to become Brownies can add the girl’s name to the waiting list at any time. If you wish to register an interest, then please visit https://www.girlguiding.org.uk and follow the instructions in the ‘information for parents’ section. Currently the leaders are Kate Fletcher (Brown Owl), Jan Higgins (Barn Owl) and Chris Stride (Eagle Owl). We are also lucky to have Livi and Ellie as Young Leaders. Meetings are held during term time from 17.45 to 19.15 on a Tuesday evening. The pack is church sponsored (but is open to all) which means that the subscriptions per term are kept low. Currently this is £15 per girl per term. There is also an annual membership fee payable to Girlguiding UK at the end of February each year. More information about the pack can be obtained from Kate Fletcher by leaving a note in St Mark’s church or emailing 3rdwincitybrownies@gmail.com Transfers from other units (Rainbow or Brownie) are possible when we have space. Please email with your daughter’s Girlguiding UK registration number. Call 0845 094 8946 between 0800 and 2000 daily. A volunteer care team, happy to give neighbourly assistance to people in the Olivers Battery area, responding to day by day requests. Services and activities offered: Shopping, collecting prescriptions, visiting the housebound, walking the dog, changing a light bulb, emergency meals, collecting library books and similar one off errands. Specialist needs are referred to a more appropriate organisation. The WI is a democratic, social and educational charity. Every WI provides monthly speakers/demonstrators on a variety of topics decided by members. Other meetings, crafts, walking, discussion or drama groups, choirs etc, are decided by members of individual WIs. Events are organised throughout Hampshire and include crafts, arts, sports, leisure, drama, public and international affairs, leadership and much more.The WI meet for eleven meetings a year on the third Monday of the month at St Peters Primary School at 7.45pm. Here the link to the Oliver’s Battery Woman Institute and the here the link to the main WI website. Meets on alternate Weds from 2.00 – 4.00pm ; call 01962 852650 for more details. A cappella world music choir that sing folk songs from around the world, usually in 3 or 4-part harmony and in their original language. They meet at St. Mark’s Church every Friday, during school term time, from 7 to 9pm. New members are always welcome; no auditions required. To find other voluntary groups in Winchester please click here.